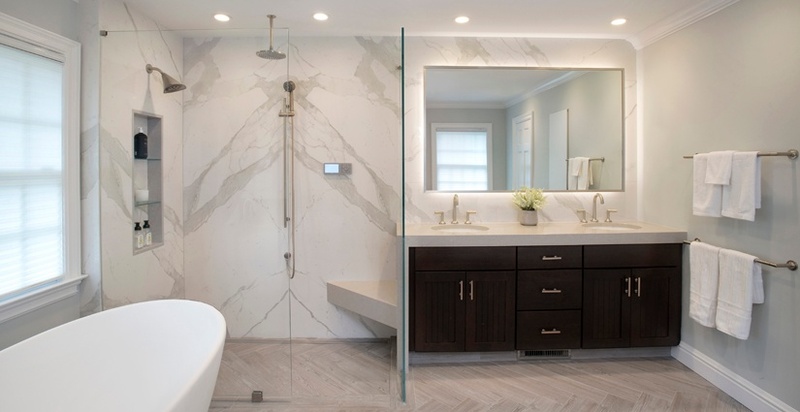 Modern Master Bath wins HOBI Award "Best Bath Under $100K"
We are honored to have been selected to win a HOBI Award for a recently completed master bath, in the category "Best Bath Under $100K". 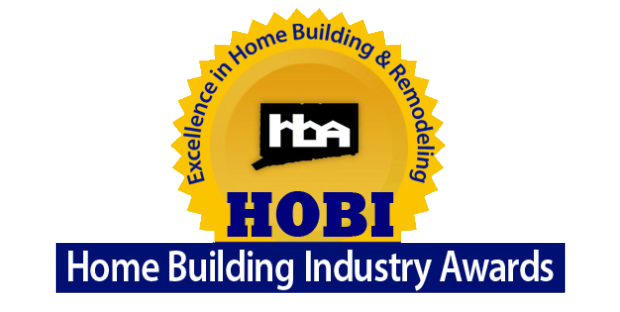 The HOBI Awards showcase the best projects in Connecticut. Our whole team is excited to celebrate at the Gala Dinner on the 13th, and to be highlighted in Connecticut Builder Magazine. 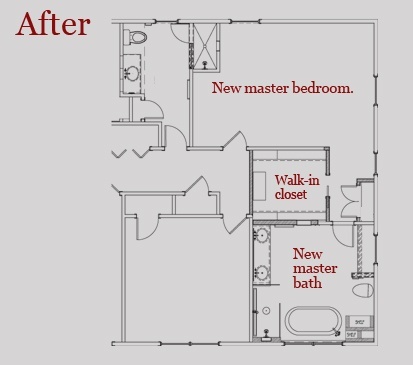 Our challenge for this project was to carve out a transitional master suite on the first floor to suit the tastes of a young couple with long-term plans to age in place, without making any changes to the exterior facade. 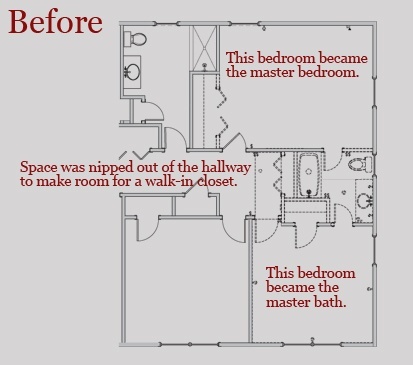 We created a spacious master bedroom suite with a modern master bath, the star of this remodeling project, by commandeering a bedroom, a small jack and jill bath and a snitching a little space out of a hallway. Our clients say that this private in home retreat has “wow power” with all the latest gadgets, from a Moen One to the Kohler Veil toilet, that welcomes you when you approach it. But the "wow" is counterbalanced with quiet colors and soft drama ; creating a serene place for them to relax and get away from it all. Enormous attention to detail in order was required to fit everything in just perfectly and use every inch of space. Working around existing window positions and sizing, we centered a freestanding tub under the window. 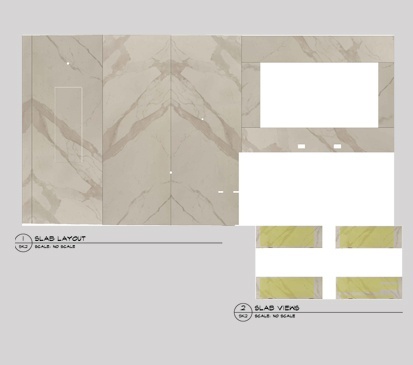 A barrier-free open shower with large format porcelain slabs is to its right. Custom storage to accommodate baskets for towels and toiletries is conveniently located to the left of the tub. The towel and toiletry niches were optimized for particular Crate and Barrel baskets. drawers below where you can drop a towel or just sit and catch your breath after a busy day. 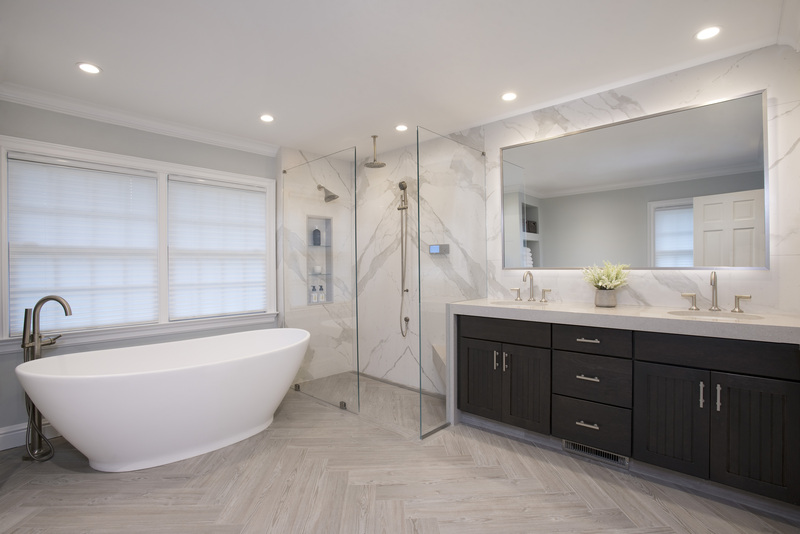 It’s a bath with a personality that is a little out of the ordinary, using color, textures, the warmth of wood, and lots of customized storage space. The design elements work together to create something fresh and exciting. The glossy porcelain slabs are offset by the texture of the (heated) herringbone tile floor. Darker richer element such as the oak vanity and bench provide pops of color. Bottom up blinds provide privacy and filter the natural light. 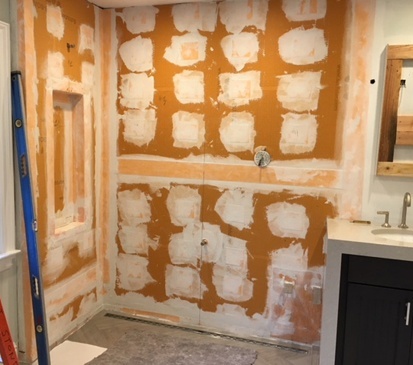 The lighting plan included small recessed lights and a custom backlit LED mirror that was just the right size for the space, to provide pleasing lighting for daily activites at the sink work stations. 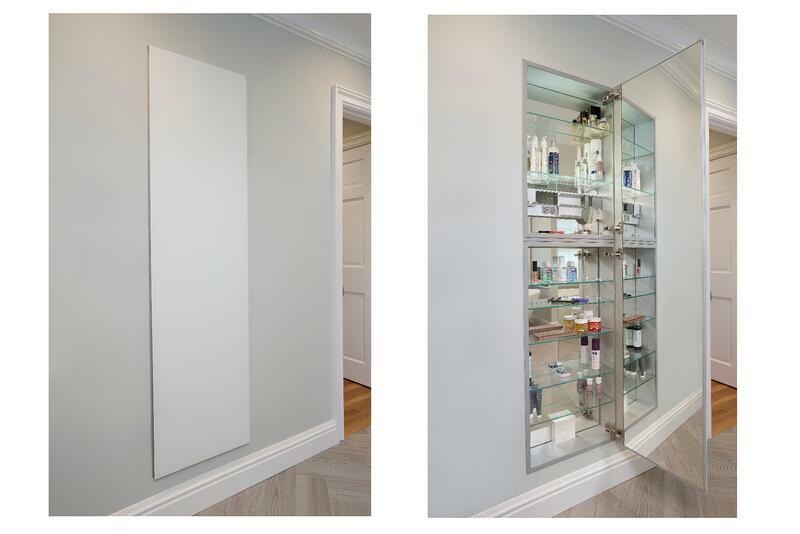 To keep the clutter down, a full height Robern medicine cabinet provides easily accessible storage, doubles as a charging station and provides a full length mirror on the inside. You can use it as a work station and put your makeup on there, it's that convenient! 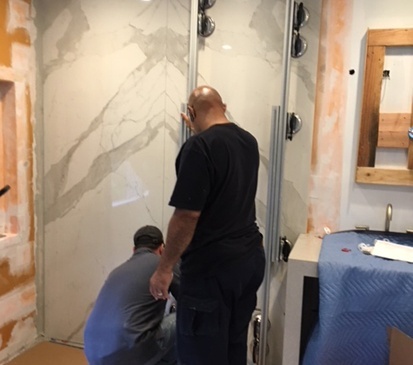 We used large glossy porcelain slabs in the shower and on the vanity wall. We and the clients were excited to include these in the design, but they turned out to be nearly impossible to get and install. 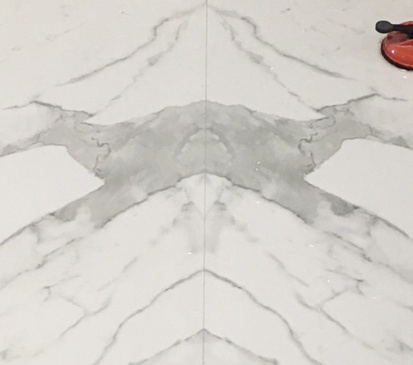 Everything that could go wrong with the Neolith porcelain panels did, but persistence and determination got us to the finish line. The first batch was damaged on the container from Europe, the second batch had the wrong pieces requiring re-design, then during fabrication, the product developed hairline cracks which turned out to be because the material was defective. redesigned the panel layout. We danced a fine line with the challenge of balancing between the precision of making pieces in the shop, the need for field cutting for a precise fit, and the risk of damaging things along the way. The sequencing of this was challenging, especially with the incorporation of a custom integrated niche with glass shelves. But we stuck with it, and the final result is a bathroom the clients love, and one of which we are incredibly proud!